THE ROAMING SKIER is about opening up your mind and more importantly your skiing to a world of unlimited adventures. Travelling the world through skiing has been my life’s passion and I have realised to really make the most of your adventures the use of the best coaches and local mountain guides is the smartest and wisest choice you will ever make. THE ROAMING SKIER is here to inspire and connect you with some of the most exhilarating people and destinations that you’re skiing can take you. 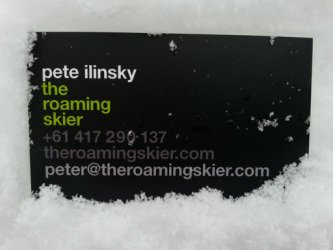 THE ROAMING SKIER is not a Travel Agent, THE ROAMING SKIER is what i like to think of as a Ski Adventure planner! My adventures focus on individuals, groups or families who can select from All Terrain, All Mountain, Backcountry coaching courses to classic multi-day ski adventures through the Alps or combine a heli and backcountry day in New Zealand or Alaska. THE ROAMING SKIER specialty is bespoked ski adventures. If your dreaming of skiing something completely different, travelling to exotic destinations, we can help make that ski dream become a reality. ADVENTURE: THE ROAMING SKIER is about escaping the ordinary and embracing the adventure. Our mission is to keep searching for new and exciting destinations, while offering a superior service and product knowledge that will keep you excited and inspired and keep you coming back for more. DISCOVERY: THE ROAMING SKIER in association with its select group of skiing partners use a team of handpicked coaches and mountain guides who not only have your safety as their number 1 priority, but will open your mind to the immense possibilities of the mountain environment. CONNECTION: The more we experience and put ourselves in changing environments the more our confidence increases and our abilities improve. We meet new people we learn new skills and we adapt to new situations. To provide the client with the most flexibility in selecting the skiing adventure that suits you, we have options that enable you to make a choice when it comes to selecting your travel and accommodation requirements. As this is your adventure you can organise your own travel and accommodation requirements if you prefer. However we can also offer the services of snow travel specialists who can organise simple or complex travel arrangements to help you with all your planning needs and offer the right advice along the way. We are able to put together complete packages to suit, which will include the skiing adventures, accommodations and all your travel options.